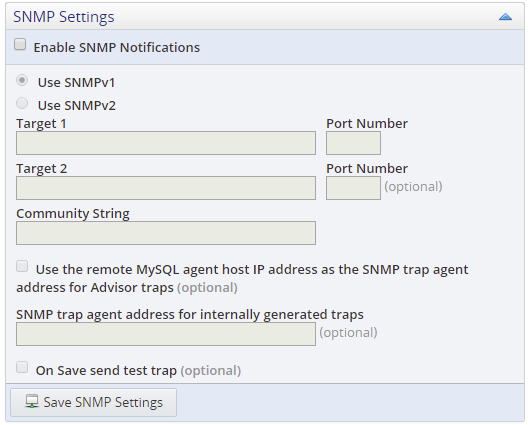 The SNMP Settings section enables you to define the SNMP trap configuration, such as SNMP version, SNMP targets, and so on. Activates the SNMP configuration fields. Choose the version of SNMP you intend to use. IP address and Port number of the system which receive the SNMP Traps. SNMP community string. Default value is public. Defines the source IP address included in the trap. Disabled: the trap uses the IP address of the service manager. Enabled: the trap uses the IP address of the agent monitoring the host for which the advisor was triggered. Send a test trap message when Save is clicked. Select one, or more, of the trap types from the list. One trap is sent for each option selected.